So what’s our project? Our project this week is the Steampunk Gargoyle! Three cheers for Gargoyles! Before we begin, you’ll see my gargoyle above. You will notice that as many of the recent tutorials, mine is very different from Christi’s. Why? We have talked before about voice and finding your voice in clay. Finding your “voice” is about expressing yourself as an artist. I am so proud of each of you who are posting your results on our FaceBook Group Page. WOW! You are really expanding, using Christi’s tutorials more as a model and allowing your style to come through … and that’s exactly what we set out to achieve by the end of this project. For those of you who have achieved this – I AM PROUD OF YOU! For those of you who are still working on it or just joined us late in the year – don’t give up – You CAN do it! Be truthful to your own style, likes, & dislikes to let your voice shine though. We are down to our final few Steampunkery projects. Christi’s gargoyle is majorly awesome. Your assignment is from her book this week on page 56. If you’re not into scary or want a different kind of Gargoyle, feel free to follow this tutorial. In invite you to turn to page 56 and you’ll see exactly what I’m talking about … pure creativity and awesomeness! Here’s why I made my different … I don’t do scary, I do cute. I don’t even do “Halloween” decorations in my house … why … yep … too scary. So this being said, I made my own steampunk gargoyle and turned him into a figurine. Although if I had a nifty hat to put a pocket gargoyle in (like Christi does in her book), or if I wore a lab coat, or if I wore shirts with pockets … I’d make Christi’s pocket version in a heartbeat! NOTE: You do NOT have to purchase this tutorial to do this week’s project. Simply follow the tutorial in Christi’s book. If you would like a more whimsical gargoyle, this is the project for you. Or try this updated Dog gargoyle project here. Round circle cutter set to help you measure even portions of clay. 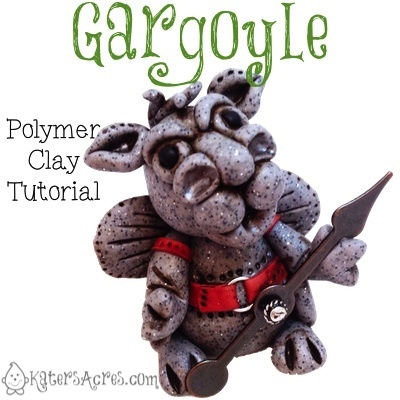 This tutorial includes instructions for making and designing your polymer clay gargoyle. This tutorial includes full color photographs, steps in outline format, hints, ideas, and other tips for creating a clay masterpiece. This tutorial assumes a basic knowledge & understanding of polymer clay & its workability. Links in this post go to Amazon where I am an affiliate. I thought this link was to take me to a Steampunk Cog tutorial. This is the gargoyle tutorial from last week. Thanks for all the additional steampunk tutorials you have generously provided! Thank you so much Katie, LOVE it!